Both my father and grandfather worked through a heart attack. Not only worked through it, but went to work the next day. And the day after that... I always found that admirable. I'm not close with my father anymore, but I saw him at Christmas and learned that after nearly fifty years at the same company, a company where he began as a floor boy and worked his way up to running the department, he had been fired just months before retirement. I asked him why, and he said they were trying to make him lie to customers he had been supplying products to for decades about the quality of the work. They wanted him to pawn off cheap materials as the real thing and charge the customer more. He refused. They fired him. Implicit in that story you have all you need to know about my cognitive dissonance concerning the Protestant work ethic. I find that when I take on a task I tend to be rather dogged and pursue it until the job is finished, or my body gives out, whichever comes first. I don't know why. It's like some demonic chase pack of hounds is bearing down on me. 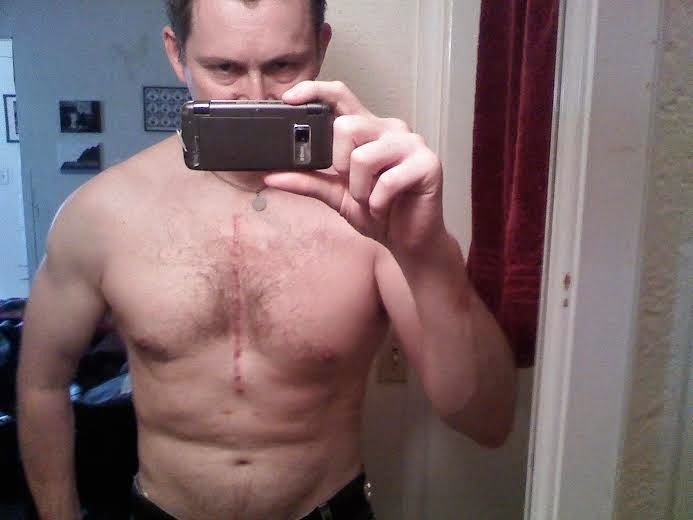 This is me seven months after heart surgery. I am at no greater risk of a heart attack I am told by specialists because of this surgery. So, for six months now, because the first month I was advised to engage in no strenuous activity, I have been testing the limits of my endurance. Cardio and weights approximately five times a week. Two children. An art career that has picked up substantially this year. You can't see it from this picture, but I am a mass of bruises. I was told this would happen because of the blood thinner I take to keep my blood from clotting. Mostly I guess I just wanted an excuse to post this picture, because I have constant fears about my body now. I really have no idea what the best case scenario for me is with all the robotic parts I have inside me. I'm not sure if I should be as vigorous as possible or take it easy. Day by day I learn something new about my new body, about my new blood.